Screw Hook 3/8" diameter x 5 17/32" long. Hooks used to attach wedge type service drops and deadend clamps to crossarms, poles or buildings. Hook has 3 /8" gimlet threads. Angle Screw with 3/8" machine thread to install porcelain T knob and #24 wood screw thread for attachment at the home or building. Install drop wire clamp bail to porcelain knob to provide an insulated drop attachment. Meets Bellcore CA06432. Angle Screw with 5/16" machine thread to install porcelain S knob and #20 wood screw thread for attachment at the home or building. Install drop wire clamp bail to porcelain knob to provide an insulated drop attachment. Meets Bellcore CA06432. Drive Ring loop is 1 1/4" in diameter. Use to secure or temporarily support drop cable on the pole. Meets Bellcore CA06835. Drive Ring loop is 1 1/4" in diameter with a long pin. Use to secure or temporarily support drop cable on the pole. Meets Bellcore CA06835. Drive Ring loop is 1/2" in diameter. Use to secure or temporarily support drop cable on the pole. Meets Bellcore CA06835. Drive Ring loop is 5/8" in diameter. Use to secure or temporarily support drop cable on the pole. Meets Bellcore CA06835. Drive Ring loop is 5/8" in diameter with a long pin. Use to secure or temporarily support drop cable on the pole. Meets Bellcore CA06835. Drive Ring loop is 7/8" in diameter. Use to secure or temporarily support drop cable on the pole. Meets Bellcore CA06835. Drive Ring loop is 7/8" in diameter with a long pin. 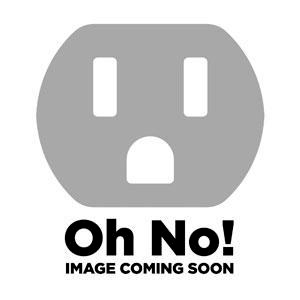 Use to secure or temporarily support drop cable on the pole. Meets Bellcore CA06835. Drive Hook 7/16" diameter x 4 3/4" long. Hooks used to attach wedge type service drops and deadend clamps to crossarms, poles or buildings. Drive Hook 5/16" diameter x 3 1/2" long. Hooks used to attach wedge type service drops and deadend clamps to poles or buildings. Screw Hook 3/8" diameter x 4" long. Hooks used to attach wedge type service drops and deadend clamps to crossarms, poles or buildings. Hook has 3 /8" gimlet threads. 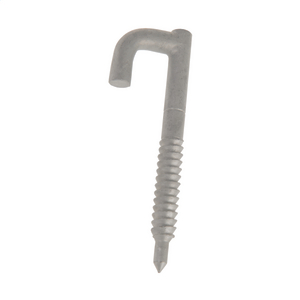 P House Hook, 3 3/4"
P House Hook 3 3/4" in length with #14 wood screw thread for attachment at home or building. Loop drop wire clamp bail over 'P' section of house hook. 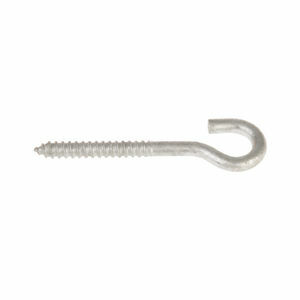 P House Hook, 4 1/2"
P House Hook 4 1/2" in length with #14 wood screw thread for attachment at home or building. Loop drop wire clamp bail over 'P' section of house hook. Ram's Horn Hook attaches at the home or building with 1/4" hardware (not provided). Loop drop wire clamp bail over ram's horn hook. Wrenchable P House Hook 4 1/2 in length with #14 wood screw thread for attachment at home or building. Use a 7/16" driver to install. Loop drop wire clamp bail over 'P' section of house hook. Wrenchable P House Hook 6 1/2 in length with #14 wood screw thread for attachment at home or building. Use a 7/16" driver to install. Loop drop wire clamp bail over 'P' section of house hook.